Home » Village History » Rothley War Memorial » BOWLER R.P. Killed in action on the 24th September 1918 aged 28 years. 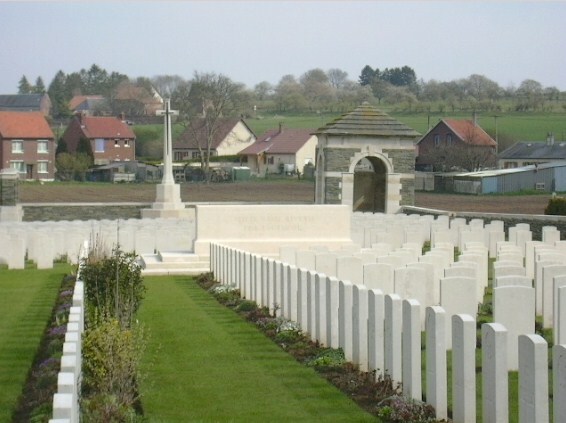 Originally buried in St. Helene British Cemetery, Pontruet in an area of 1/5th Leicesters burials marked 'buried near this spot'. Sergeant Bowler was re-buried in Cerisy Gailly Military Cemetery in 1926. His gravestone inscription is "GOD BE WITH YOU TILL WE MEET AGAIN"
Son of Jacob and Priscilla Bowler. Brother to Sarah A, Martha, Albert Henry, Hubert Edgar, Jacob Leonard, Reuben Walter, Kathleen E, Evelyn J H, Frank L V and Doris W. The family lived at Dobb Hall, Rothley at the time of Reuben's death. His brothers Albert Henry Bowler and Reuben Walter Bowler were also killed in action and two others wounded. Albert Henry is commemorated on the Quorn War Memorial and Reuben Walter on the Rothley War Memorial. 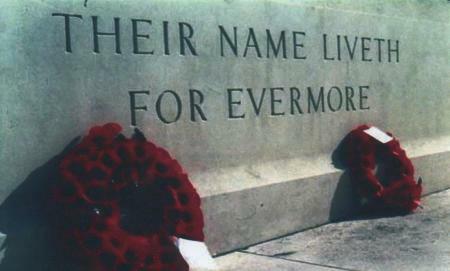 Named on the War Memorial and Parish Church Triptych Roll of Honour. LE VERGUIER. Report on operation of September 24th attached. NOTE: A subsequent examination of the village has proved that 2 Lt's QUINT and ASHER penetrated to and were killed in the furthest south corner of the village where there were also found several other men of A Coy. ? a noticeable thing that there was no corner of the village which did not contain scenes of the fight and that the dead of the 5th Battn LEICESTERSHIRE REGT were lying with-?- like and ? still with ? and ???? in front. During the morning Battn HQ moved to a bank alongside Regimental Aid Post, but shelling was so continuous that work was impossible and communications broke down they therefore returned to hilltop near tunnels. 10.00pm. It was decided that Battn should be relieved by the 8th Battn NORTH STAFFORDSHIRE REGT but owning to uncertainty of line held and strength of enemy in the village it was finally decided to withdraw to a line on north and west side of village including FOURMI TRENCH. During the early part of night 23rd/24th Captain G.E.BANWELL M.C. employed for the time at Battalion HQ taped out a "jumping off line" between FORGANS TRENCH and ST. HELENE-PONTRUET ROAD (about 100 yards north west of 100 contour). Line ran approximately south west-north east. In addition a guiding tape was laid to assembly position from the valley behind. Soon after midnight 23rd/24th Companies were relieved by the 6th Battalion SOUTH STAFFORDSHIRE REGT (LISTER) and leaving their great coats formed up on the reverse slope of the "RED LINE" ridge. Hot teas and a Rum Ration were issued to all. Battalion HQ moved to A Company HQ 400 yards south east of RED WOOD on the summit of ridge. At 4.30am Companies assembled in four lines of platoons in fours, 1, 5, 9, 13 leading. A Company (BRODRIBB) right, B Company (TOMSON) right centre, C Company (HAWLEY) left centre, D Company (BROOKE) left. A few hours before assembly, enemy had raided FORGANS and it was feared he might still be near the assembly position. In order to minimise risk of being observed, D Company were ordered to assemble in FORGANS and only get out to attack it at ZERO. On arrival at assembly position Lieutenant A.E.BRODRIBB was slightly wounded by shell splinter in the thigh. He went to Regimental Aid Post and 2nd Lieutenant A ASHER took over command of the Company. Finding however that he could still walk Lieutenant BRODRIBB returned when his wound was dressed and resumed command as the attack started. At 5.00am the Barrage started and the Battalion advanced. Phase 1. 5.00 to 5.15am. Timing of barrage was almost exact and with exception of D Company. Battalion moved forward all together in south east direction. A Company with the road to guide them advanced closest to the barrage, swept over ST. HELENE and by 5.14am were in position for the right turn, No. 1 platoon (QUINT) having reached the east edge of the village, No. 4 platoon (DENNIS) had slightly lost direction during the advance but regained it and was ready to enter the village. B and C Companies were slower owing to the darkness and on reaching the ST. HELENE-BELLENGLISE ROAD came under very heavy machine gun fire from FORGANS TRENCH. At the same time the smoke barrage from south west edge of village blew across and made it doubly difficult to keep touch and direction. Considerable confusion was caused and both Companies (consisting now of odd sections and platoons separated and following their commanders) swung to the left. The machine gun fire was very heavy from FORGANS TRENCH and soon after breasting the first slope B and C Companies encountered a trench running from FORGANS towards PONTRUET about which nothing was known. It had in fact been dug during the night. The trench coupled with the smoke and darkness completely baffled the leaders and all who could, made for the FORGANS TRENCH that being the direction from which fire was coming. Several parties penetrated the trench which was held with machine guns every few yards. One of these parties consisted of Captain J.W.TOMSON and B Company HQ (Signallers, Runners etc). This small party forced its way through the wire and found themselves up against three machine guns. Captain TOMSON with a shout of "COME ALONG THE TIGERS SHOW THEM WHAT YOU CAN DO" rushed the second and third guns but missed the first. Both teams were overcome but the Signal Corporal was hit and Captain TOMSON bending down to attend to him was himself shot through the head and killed. Only two of this party managed to cut their way out. In another part of the trench Lieutenant J.C.BARRETT and a mixed force of B and C Companies succeeded in breaking in only to find that they were at once bombed from all sides. Lieutenant BARRETT though wounded held up one bombing party with his revolver until he was wounded in the arm and unable to carry on. He then collected his N.C.O. 's to-?- them the way to go and ordered them to try and fight their way back. He was hit once again while crawling away and was eventually carried out of the Battle. Some parties also fought their way in and out again but ? to impossibility of keeping touch, the trench could not be held. Two platoons of B Company managed to keep their direction partially. 2nd Lieutenant J.W.LEWIN got into east end of village and was then wounded. 2nd Lieutenant E.COSGROVE and most of his platoon entered the village in rear of A Company. Owing to the men being in the trench D Company were slightly behind at the start and some sections started to "work up" the trench instead of getting on top. Unexpected resistance was met at ST. HELENE-BELLENGLISE ROAD where post of four machine guns held out supported by bombers and trench mortars from trench running north east. When remaining Companies were entering the village, D Company were still held up at this point. It was still dark and the smoke was very thick. (a) At 5.15am A Company followed by some of B Company turned south west into PONTRUET. The right again had the easier task with a road to give them direction. The left was less fortunate. Both platoon commanders (QUINT and ASHER) were killed before they had gone many yards and platoons instead of working slightly left to include south corner of village apparently drifted more towards the cemetery. The village was strongly held. For about one hour and ten minutes A Company fought their way through finally breaking out on the corner near the BLOCKHOUSE bringing with them some 100 prisoners and four machine guns. At least 200 of the enemy must have been killed by this company as many sections refused to accept surrenders and killed whole machine gun crews. C.S.M.WARDLE and Sergeant TOON, Lance Corporal's DOWNS and STARBUCK distinguished themselves as leaders in this fight. On gaining north west side of village Company formed up and turned about, pushed posts round blockhouse and Crucifix and prepared to assault positions in PONTRUET and PALARIC TRENCHES where enemy machine guns were still holding out and delaying advance of 1st Division. Covered by Lewis Gun fire and No. 36 grenades an attack was made on these guns but many men were hit and guns not reached by the time all Lewis Gun ammunition and bombs exhausted. Company therefore reformed under 2nd Lieutenant DENNIS and prepared to hold what they had got. Lieutenant BRODRIBB exhausted, now went to Regimental Aid Post. Two parties of B Company joined them under 2nd Lieutenant COSGROVE and Corporal BARBER. The latter took up an independent position near the Crucifix and covered the road running north east with his Lewis Gun. All these very short of small arms ammunition. An attempt was made to get assistance of Tank of 1st Division and attention of Tank was called to machine guns. Unfortunately Tank was put out of action and could not move. Messages were sent for small arms ammunition and bombs but by 9.00am smoke cleared and movement in north, north west and north east sides of the village were almost impossible. Sniping very accurate and good machine gun fire from GERMANS on south side of village and ridge. Company therefore took up defensive position along DYKE in touch with 5th Battalion SHERWOOD FORESTERS on right with a few forward posts in the village. (f) It was soon found that the few isolated parties in FORGANS could do nothing and as soon as daylight came their positions became very critical. Two parties were rallied, one under Lieutenant STEEL of about 20 men held the bridge on ST. HELENE-PONTRUET ROAD just in the village. Another larger party under Lieutenant A.E.HAWLEY occupied a line along the same road as far as and including the south end of FOURMI TRENCH. A small party, most of whom were afterwards wounded held the X roads. The east end of the village was too exposed and held by neither side. These parties prepared to hold their edge of the village against counter attacks while mopping up was continued by A and B Companies. (g) In the meantime a strong attempt was made to oust the enemy from his machine gun post on the ST. HELENE-BELLENGLISE ROAD. Our attack was met with a hurricane of bombs, trench mortars and machine gun fire. 2nd Lieutenant BUCKLEY and Lieutenant SLOPER were both wounded. Captain J.R.BROOKE M.C. then led the attack in person. He was wounded once but went on until wounded again. He was then carried out of action. The Acting Company Sergeant Major, Sergeant MARSTON continued the attack and the post was rushed, the crews of the machine guns fled and four prisoners were taken from one dugout. By this time it was daylight, the whole could be overlooked from FORGANS-BELLENGLISE and the ridge and accurate sniping started at once with trench mortars and machine guns. As post was untenable and casualties were numerous, a block was built about 40 yards up the trench and this was held. Enemy was prevented from holding his post by vigorous bombing from this block. A large number of prisoners were taken as far as the Regimental Aid Post and left there by men who wanted to "go back and kill some more". Many of these were consequently sent through 139th Infantry Brigade. Enemy counter operations. Position of our troops remained materially unaltered throughout the day. Lack of communication and bombs made further mopping up impossible, and all attempts to get bombs were defeated by enemy machine gun fire. Meanwhile enemy started to dribble back into south west corner of village. FORGANS TRENCH was strongly occupied and men started to go by small bodies round south side of village into PALARIC TRENCH. FORGANS was bombarded for one hour and no attack materialised; enemy must have heavy losses here. By dusk enemy were strong in PONTRUET and PALARIC TRENCHES, but in remainder of village only a few "lost" men were wandering about. SOUTH STAFFORDSHIRE REGT assembled south of FORMI TRENCH and advanced without a barrage on the village. At the same time DENNIS with about 40 of his party in two groups went via CEMETERY along road running between PALARIC and PONTRUET TRENCHES. They reached the high ground on the outskirts of the village and got into touch with the SHERWOOD FORESTERS on their left. Enemy were strong on their right and considerable number seemed to be "in their left rear" presumably PALARIC. One party of 8 BOSCHE with a machine gun who appeared were bowled over by a Lewis Gun. No touch could be obtained with right. SHERWOOD FORESTERS Company advanced and found no opposition in east end of village but stated that they could not get in touch with C Company on their left. Their Officer therefore ordered them to fall back again to dyke position. A Company and B Company therefore conformed. This operation was a failure because in the rambling village, 700 yards long, parties could not by night keep touch. In view of what has since been discovered it is probable that village might have been cleared and held if (1) The SHERWOOD FORESTERS on right had swung round to conform (2) The enemy east end had been neglected and all available men launched against PONTRUET and PALARIC TRENCHES. At 2.30am a general withdrawal was ordered and village evacuated. Our casualties were killed 3 officers, Captain TOMSON, 2nd Lieutenant's QUINT and ASHER. Missing 1 officer, 2nd Lieutenant LEWIN (known to be wounded). Wounded 8 officers, Captain BROOKE, Lieutenant's BARRETT, BRODRIBBS, SLOPER, 2nd Lieutenant's DENNIS, PARSONS, BUCKLEY. Killed, other ranks 11 (including Lance Sergeant DARBY). Missing other ranks 28 (including Sergeant BOWLER ). Wounded other ranks 118 (including Sergeant's SULLIVAN, HARRISON, BEARDSMORE, READHEAD). Regimental Aid Post was under a bank in valley 800 yards west of ST. HELENE. 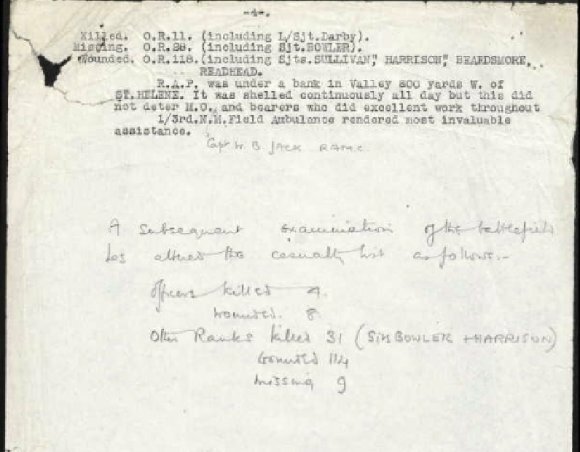 It was shelled continuously all day but this did not deter Medical Officer (Captain W.B.JACK, ROYAL ARMY MEDICAL CORPS) and bearers who did excellent work throughout. 1st/3rd North Midland Field Ambulance rendered most invaluable assistance. A subsequent examination of the battlefield has altered the casualty list as follows:- Officer's killed 4, wounded 8. 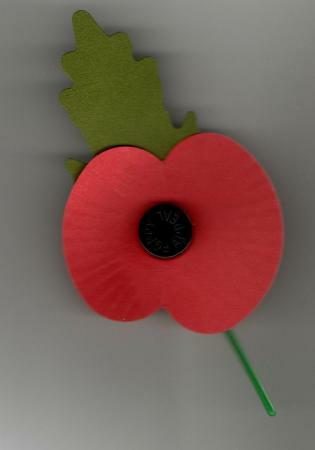 Other Ranks killed 31 ( Sergeant's BOWLER and HARRISON), wounded 114, missing 9.